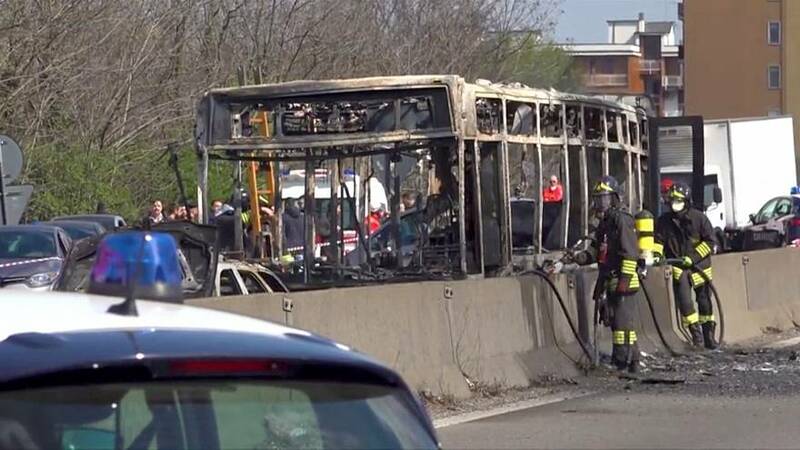 A man hijacked a school bus with 51 students aboard before setting the vehicle ablaze in an apparent protest over Italy's migration policy, police said. The children were getting off the bus as the fire was started and although some youngsters were hospitalised no-one was reported to have been seriously injured. "San Donato police have arrested the driver of a middle school bus. He had taken 51 students. He was stopped after ramming three patrol cars. During the descent of the children from the vehicle, he set the bus on fire," said a tweet by the Carabinieri. At a Thursday press conference, Alberto Nobili, head of the counter-terrorism at Milan public prosecutor's office, said the driver had no links with Islamic terrorism and "acted as a lone wolf". Nobili added that Sy had been planning the kidnapping for awhile and "wanted the whole world talking about this story." A teacher that was on the bus with the children, said it wasn't the first time this man drove a school bus with children inside. "We knew him," the teacher told Ansa news agency, adding he was angry about the government's migrant policy. He also said that Sy's Italian citizenship could be revoked if convicted of terror under a new security decree put in place last year. Italy's Ministry of Defence thanked the police for saving the children in time.